The FUJISOFT GROUP (“the Group”) will operate with the aim of “becoming an innovative corporate group that links ICT development to greater value for customers,” under its basic philosophy. The Group has built an organizational structure that can respond quickly to changes in the business environment, enhancing its corporate governance by ensuring management health and efficiency and increasing management transparency by pressing forward with the following initiatives. (1) The Group has introduced the operating officer system to accelerate the speed of decision-making and strengthen the management supervisory function by clarifying the responsibility for execution of business, improving the efficiency and increasing the speed of business operation and streamlining the Board of Directors. (2) While the Group has adopted a company with a board of auditors as an institutional design as a company, the Group deliberates on significant matters to be submitted to the Board of Directors for discussion in advance at the Nomination Committee, the Compensation Committee and the Ethics Committee, which are established as voluntary organs in which outside directors also participate as members. (3) All outside directors of the Group meet the requirements described in the judgment criteria for independent officers established by the Tokyo Stock Exchange. They are capable of exercising supervision and advice from an unbiased external standpoint and simultaneously possess deep insight and extensive knowledge and experience in the area in which they specialize. and believes in a comfortable and rewarding environment. FUJI SOFT INCORPORATED (“the Company”) is a company with a board of auditors and has established a general meeting of shareholders, the Board of Directors and the Board of Auditors as specified by the relevant laws and regulations. The Board of Directors consists of nine directors, including two outside directors that are designated as independent officers, based on the regulations of the Tokyo Stock Exchange. The Board of Directors meets regularly once a month and on a temporary basis as needed, attended by four auditors including two outside auditors (of whom one is an independent officer), and passes resolutions on all important agenda items relating to management, in addition to matters specified by the relevant laws and regulations. The Company has established a Management Conference, attended by the directors, the standing auditors and the operating officers (held twice a month or on a temporary basis as needed), as a deliberative organ for matters relating to the execution of important business based on the management policy set by the Board of Directors. To contribute to deliberations at the Management Conference, the Company has also set up a strategy meeting and a company-wide liaison meeting for each purpose to hold full discussions and make coordination, etc. For specific matters, the Company has established the CSR Promotion Committee, the Internal Control Committee, the Risk and Compliance Committee and the Reward and Disciplinary Committee, etc. to deliberate on and coordinate matters under their respective jurisdictions. 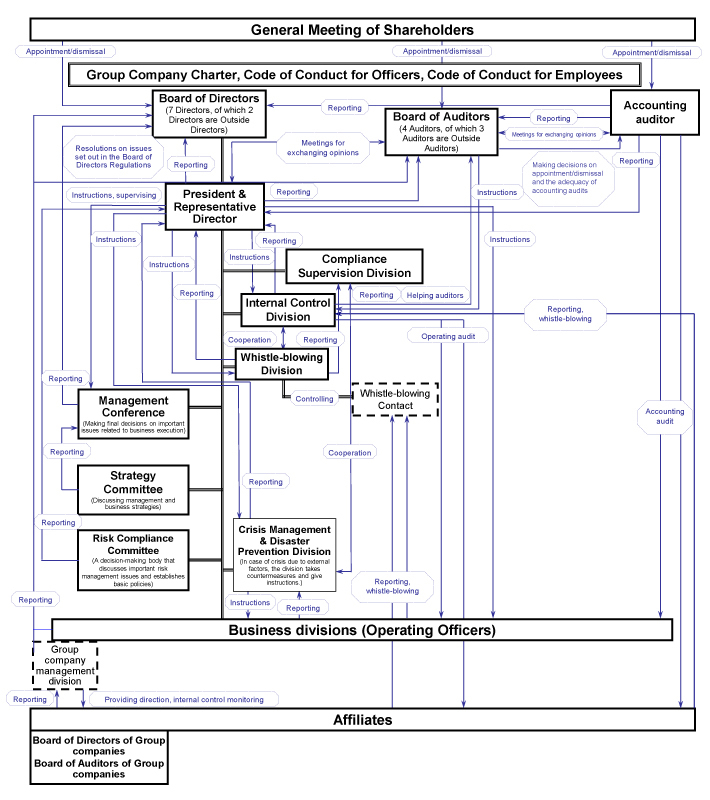 In addition, the Company has introduced the operating officer system to clearly separate the strategic decision-making and business supervision functions of the Board of Directors from the business execution function of operating officers and to facilitate the quick execution of business by assigning operating officers who have acquired the relevant proficiency to major business divisions. We hold cross-held shares to enhance corporate value, comprehensively taking into consideration our strategies and business relationships with customers, etc. The basic policy in holding these shares is to consider selling stocks the holding of which is no longer deemed significant, while giving attention to the impact on the market and other circumstances to be considered. To enhance corporate value, we regularly check whether the cross-held shares are necessary for the growth of the Company, whether the purpose of acquisition has been achieved, and changes in profitability after acquisition. We also monitor the reasonableness of continuing to hold stocks in terms of the management of risks such as impairment. We periodically report the results of the checks to the Board of Directors. We exercise voting rights to cross-held shares based on judgments made after comprehensively taking into consideration whether their agenda items comply with the Company’s policy on holding cross-held shares and whether they are useful for the efficient and healthy management of the issuing companies and can be expected to contribute to the enhancement of corporate value. We have not set unified standards for exercising voting rights as of this moment because qualitative and comprehensive judgments are required according to individual stocks. The Company has adopted a policy in which deliberations and resolutions at meetings of the Board of Directors are required for competition transactions and conflict-of-interest transactions with a director or an operating officer and a corporation that is effectively controlled by a director or an operating officer. With respect to related party transactions, the Company has established a system to manage such transactions by passing a resolution at a meeting of the Board of Directors after excluding the relevant officer from a quorum for the resolution as a special interested party. Management philosophy, management strategies and medium- and long-term management plans of the Company are disclosed in its website and IR presentation materials. Remuneration for directors (including part-time directors) consists of the basic remuneration and bonuses, and the total amount is specified at a general meeting of shareholders. The basic remuneration is determined by a resolution of the Board of Directors based on the amount set by position and the grade and class of directors within the range of the total amount determined by the general meeting of shareholders. Bonuses are determined according to a calculation formula and the business performance based on the basic remuneration. When a director retires, an amount that is determined based on the separately established Regulations on Retirement Benefits for Executives will be paid after a resolution of the general meeting of shareholders. Remuneration for auditors (including part-time auditors) consists of the basic remuneration and bonuses, and the total amount is specified at a general meeting of shareholders. The basic remuneration is determined through consultation among the auditors based on the amount set by the grade and class of auditors within the range of the total amount determined by the general meeting of shareholders. Bonuses are determined according to a calculation formula based on the basic remuneration. When an auditor retires, an amount that is determined based on the separately established Regulations on Retirement Benefits for Executives will be paid after a resolution of the general meeting of shareholders. Individual remunerations are not disclosed. * 1. The amount paid to directors does not include employee salaries for directors concurrently holding the post of employee. 2. The remuneration limit based on a resolution of the general meeting of shareholders (held on June 25, 2007) is 700,000 thousand yen for directors and 70,000 thousand yen for auditors. 3. The data above include an auditor who retired on March 17, 2017. When we appoint an operating officer and nominate a candidate for director or auditor, we deliberate pursuant to the provisions of the Executive Appointment Standards at the Management Committee, which includes outside directors as members, before the Board of Directors makes a resolution. Information on individual appointments and nominations has been published in the Notice of Convocation of the Annual General Meeting of Shareholders. To clarify responsibility for the execution of business and strengthen the management supervision function, the Company has introduced the operating officer system, and the Board of Directors has delegated the power of decision on the execution of business to the Management Conference and the operating officers in charge, except for matters that must be resolved by the Board of Directors and the important operating matters that are specified by the Board of Directors Regulations. The Company has appointed two independent outside directors, and they are contributing to the sustainable growth of the Company and the enhancement of its corporate value for the medium to long terms by actively expressing their opinions at the Board of Directors meetings from an objective standpoint independent of the management team. In addition to the judgment criteria of independent officers established by the Tokyo Stock Exchange, the Company has a policy of appointing a person who is able to supervise management and give advice from an unbiased external standpoint and who has deep insight and extensive knowledge and experience in his/her area of specialization as an independent outside director, as the criteria for judging independence. Currently, the Company’s Board of Directors consists of nine directors and four auditors. To ensure the objectivity of the Board of Directors, the Company has decided as a basic approach to appoint more than one outside director and form the majority of auditors with outside auditors. Directors are appointed by the Board of Directors based on the result of deliberations at the Management Committee in accordance with the Executive Appointment Standards. Outside directors are appointed by the Board of Directors based on the result of deliberations at the Management Committee in accordance with the criteria for judging the independence of outside officers, in addition to the Executive Appointment Standards. Currently, the balance of knowledge, experience and capabilities, diversity and size of the Company’s Board of Directors as a whole are appropriate given the business scale, lineup and performance as of this moment. We will continue to act flexibly so that these elements will be most appropriate for the business lineup, etc. The Company makes it a matter to be reported to the Board of Directors for an outside director and an outside auditor to be concurrently serving as an officer in another listed company or to be engaging in another profession. With respect to other directors, the Company makes it a matter to be resolved by the Board of Directors for them to be concurrently serving as an officer in another company, including an unlisted company, or to be engaging in another profession and approves it to the extent to which it does not pose a problem for the execution of the business of the Company. The overview of the results of analysis and evaluation of the overall effectiveness of the Board of Directors is as follows. (1) The Company’s Board of Directors consists of nine directors, including two outside directors who have met the judgment criteria for independent officers established by the Tokyo Stock Exchange. The size and structure of the Board of Directors are appropriate in light of the business scale and lineup, etc. of the Company. (2) The Board of Directors meets 16 times a year (12 regular monthly meetings and four other meetings relating to the settlement of accounts). The frequency of holding the meetings is appropriate. (3) The matters to be resolved by the Board of Directors that are stipulated by laws, regulations and the Articles of Incorporation and the execution of important businesses are submitted to the Board of Directors for discussion, and corporate strategies, the enhancement of corporate value and the supervision of execution are also discussed. These practices are appropriate. (4) The two outside directors exercise appropriate supervision and advice on the business operation of the Company from a wide-ranging perspective and with deep insight based on an unbiased and objective standpoint. (5) Meetings of the Board of Directors deliberate actively with useful opinions expressed by the four auditors (of whom two are outside auditors who have met the judgment criteria for independent officers established by the Tokyo Stock Exchange) from an objective and professional perspective based on their diverse backgrounds. (6) When holding a meeting, the Board of Directors distributes materials for the meeting beforehand. An orientation meeting is also held. In addition, after the regular monthly meeting, a “place to facilitate information sharing with the Board of Auditors and outside directors” is established. Because information is provided smoothly, these practices are appropriate. The Company provides the necessary training, etc. the directors and auditors to fulfill their responsibilities appropriately. Executive directors receive training as necessary by holding discussions regularly on the subject of management issues and holding study meetings to which outside experts are invited. When an outside director and an outside auditor take office, we explain the basic matters concerning the Company’s businesses and subsequently provide them with information on management issues, etc. as needed. The Company appoints an officer in charge of IR for handling applications for dialogues from a shareholder or an investor, and the public relations department, the finance and accounting department, the general affairs department and other related departments collaborate in responding to applications. For institutional investors, the Company hold a results briefing once a quarter and discloses materials relating to financial results on its website. The Company has also set up a contact for individual investors on its website. Through these initiatives, the Company is developing an environment for constructive dialogues with shareholders. If we receive an application for an individual meeting, we will respond to it as necessary. We avoid days on which general meetings of shareholders are concentrated so that more shareholders can participate in the general meeting and the meeting will be more active. We have introduced electromagnetic means for the exercise of voting rights for the convenience of shareholders, to facilitate their exercise of voting rights. To reflect in each agenda item the will of shareholders who attend the meeting on the current day, the Company conducts balloting by a voting system using an electronic device terminal in the room of the general meeting of shareholders. The Company has participated in the platform for the electronic exercise of voting rights operated by ICJ, Inc. In light of its shareholder structure, the Company regards it necessary to provide foreign investors with information in English, and publishes an English translation of the notice of convocation (notice of convocation in the narrow sense and reference materials) on its website and the websites of financial instruments exchanges.